One of the blessings of creating the St Gemma website has been the many emails and letters of devotion to St Gemma that I have received from kind people throughout the world. From India to the Philippines, from Holland to Great Britain, from Canada to Argentina---letters and emails from literally all over the world expressing love, veneration and devotion to Gemma, the "Gem of Christ". And along with the letters of devotion there are also many emails and letters expressing Gemma's remarkable intercession in the lives of many -from answered prayers, cures, conversions etc. to the dreams of Gemma and (alleged) visions; the accounts of which, all recent, are numerous and so very edifying, and they all point to St Gemma's continued and ongoing intercession on behalf of the faithful throughout the world. Gemma has even appeared and given her assistance in numerous exorcisms, as highlighted in the recent book "“The Rite-The Making of an Exorcist” (2009- Random House/Doubleday Inc). and also during exorcisms at her monastery in Lucca, both of which are detailed in this 3 part article here. But, should Gemma's intercession in the world today really be of any surprise? One can surmise that it is simply a continuation of her apostolate for the conversion of souls of which she spent her life in great sacrifice and suffering out of love for Jesus, her beloved Spouse. And now, having passed from this life on earth to a eternal life in heaven with her Jesus, she continues, even today, her intercession on behalf of souls, to guide, inspire and help us in our earthly pilgrimage. For it was the Lord Himself who on several occasions appeared to Gemma and asked her to offer herself as a victim of expiation for the sins of the world, and asked her to sacrifice her life for this purpose, and in reply Gemma offered herself without reservation. He wished for her to spend her whole being for the conversion of sinners. "If you love Me," He said to her, "You will do what I ask of you," and with a clear light He lets her see the form of her apostolate in its smallest details. "You know, oh Jesus" she answered, "how ready I am to sacrifice myself in everything. I will bear every sort of suffering for You. I will give every drop of my blood to please Thy Heart and to hinder the outrages of sinners against You." And without a doubt Gemma's 'persuasive eloquence of love' with Jesus on behalf of humanity is surely even more powerful now that she is united with her Jesus in His kingdom. 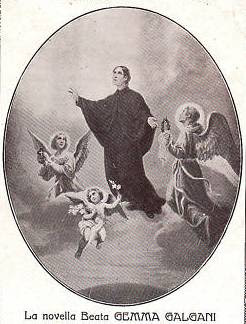 Father Germanus continues: 'This angelic girl often turned for help to her heavenly Mother, whose power with Our Lord she had well experienced in whatever she had most at heart. One day when in ecstasy she found the Holy Mother greatly afflicted and, at the same time, it seemed to Gemma that She was resolved not to take further interest in a soul for which Gemma was pleading. Behold with what earnestness this child of Heaven set about dissuading the Mother of God from what seemed to be her determination: "But what do I hear You say, Mother? Abandon that soul? Is it not a question of one belonging to Jesus? Has He not shed all His Blood for this soul? ... 'It is true, I myself have forgotten this soul for some days, but will You abandon it on this account? No, no, be firm, go and appease Jesus." Here it would seem as if the Holy Mother found the undertaking very difficult, for Gemma soon said: "But Jesus always obeys His Mother. And then will You say that You cannot do it?" And again, "Oh, rather than abandon a soul! Oh Mother, it is impossible that Jesus would forsake a soul! Why, He even had mercy on the thief!" "But do you know," replied the Blessed Virgin, "what this sinner really is? I could show thee what a malignant soul is his." And Gemma: "I know, Mother, what he is, but I don't want to look at his soul. When he is saved, yes, then I will see him. Oh my Mother, why do You treat me like this today, You who intercedes always for sinners? Have You ceased to be Mother? Surely it is impossible. But today will You leave me in such affliction? Obtain for me from Jesus what You did for me on Saturday [here she is alluding to the conversion of another sinner for whom also she had prayed very much], then how contented I will be!" And Father Germanus continues: “I will relate another fact in the words of a most reliable witness who told me of it. "I was asked," said this person, "by a lady acquaintance to recommend her brother, a great sinner, to Gemma. I did so accordingly and she while in ecstasy began to plead to Jesus for him. But He [no doubt to try her faith] replied that He knew not that sinner." 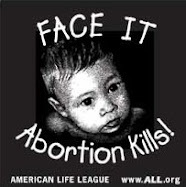 "How is it that You do not know him," she said, "since he is Thy child?" Then she turned to Mary, but seeing that even She remained silent and wept, she began to pray to Blessed Gabriel of the Dolors [St Gabriel Possenti -ed. ], and he also was silent. But Gemma, for all that, did not lose courage. She redoubled her prayers. During this time she said to me: "That man must indeed be a great sinner. Jesus says He knows him not, Mother weeps, and Blessed Gabriel will not answer me." Because of their high opinion of her sanctity, Gemma was often asked by others to pray for certain people . But it frequently happened that God Himself made such cases known to His servant directly, while she was at home, and by providential coincidences while she was out of doors. She was always ready to take charge of them whatever way they came, rejoicing in each one as if she had found a treasure and devoting herself the more earnestly to them in proportion to their number. "I would wish," she said, "to bathe with my blood all those places where Jesus is outraged. I would wish all sinners to be saved, because they have been redeemed by the Precious Blood of Jesus." The last person that she had in her mind, or, as she used to say, “that she carried on her shoulders”, was a gentleman of Lucca, a notorious and obstinate sinner, but not personally known to her. The always charitable Gemma labored long and earnestly for his conversion and renewed her assaults on Heaven without losing confidence. In her last sickness she said: "I am keeping him on my shoulders for the whole of the Lent, then he will be taken off." On Holy Thursday, the good priest who had recommended him to Gemma, all full of joy, told me that a great sinner had been converted in his hands. It was Gemma's sinner. Two days later, freed from that great weight, with another palm in hand, the Virgin of Lucca took flight to Heaven. This was the last conversion wrought through Gemma's intercession while alive here on earth, occuring only two days before her holy death. But how many more have occurred through her heavenly intercession in the 100 years since? God alone knows, but if this writers email inbox and letter box over the past few years is any indication of Gemma's ongoing intercession in the world, then the number of miracles, cures and conversions obtained through the “Gem of Christ” over the years since her death must number in the hundreds, if not thousands. 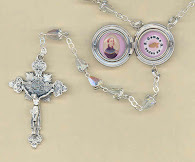 Gemma promised Jesus that she would do everything possible to save souls and she is continuing her mission from heaven today, by obtaining heavenly graces for those who seek them. And surely Gemma's promise to Father Germano can also be applied to us. 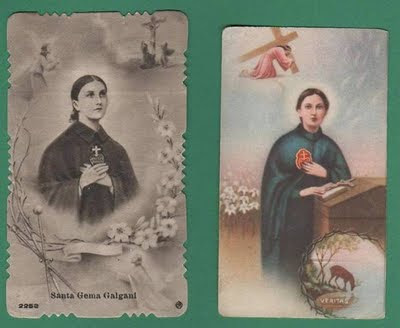 For in his other work on Gemma, “The Letters and Ecstasies of Gemma Galgani”, Father Germano publishes a letter written by Gemma to him that says: “You shall see what I will do when I go to heaven. I will bring you with me at any cost”. "Concerning our Gemma, I have only to say the most extraordinary and wonderful things continue more and more to happen to her. And when I look at her I seem to behold in her something not of this world. What a happiness to have lived thus with such an angel! A world of things would not be enough to give you an idea of what goes on in her. She is an angel in human form and that expresses all". -Letter of Mrs. Justina Giannini, mother of the Giannini family who took Gemma into their home after the death of her father. I believe that St Gemma has been guiding me and praying for my journey to be closer to God for the past few months. She's truly a wonderful heavenly sister! From the first day I read about her (through this great blog)I can feel that her heart longed for my soul to be inspired by her remarkable story and I must say, it's truly a miracle on how I get to the point of where I am right now. Thank you for this inspirational blog and may her prayers will always be with us. -Thanks for your comments. I am glad to hear of your devotion to St Gemma. I pray that she may always be very close to you, and may she lead you ever closer to Jesus, her beloved Spouse. Thank you so much for posting this, Glenn. I always look forward to the wonderful articles you post on this website in honour of our dear St. Gemma! Thanks for your kind comment Father Todd....I sincerely appreciate it. May God bless you and may St Gemma be always close to you. prayers are my last hope if I can do it. I can't do it is all I hear, because I give up so much & do not want to suffer but I have to deny myself, its the only way & I know the truth of that, I can never lust again as I have. I just need so much grace and help. St.Gemma, pray for me. 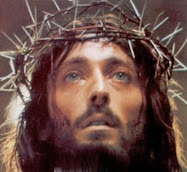 I am telling you in Jesus holy Name that you are very dear to Him, and that He offers you redemption at the price of His own blood...in return He asks that you love Him as much as you can; with all of your heart. If you are Catholic go to confession and confess your faults. St Gemma will help you to overcome your faults if you pray to her--she will lead you very close to Jesus and she will obtain from Him all the help and graces that you need for your soul and for your salvation. May God strengthen and bless you. I found this website recently and i have spent hours going through the articles and learning so much about this amazing Saint. I have chosen her as my main "Patron" Saint and i have started offering Prayers to her. I wish a lot more people knew about her because she cared so much for sinners. 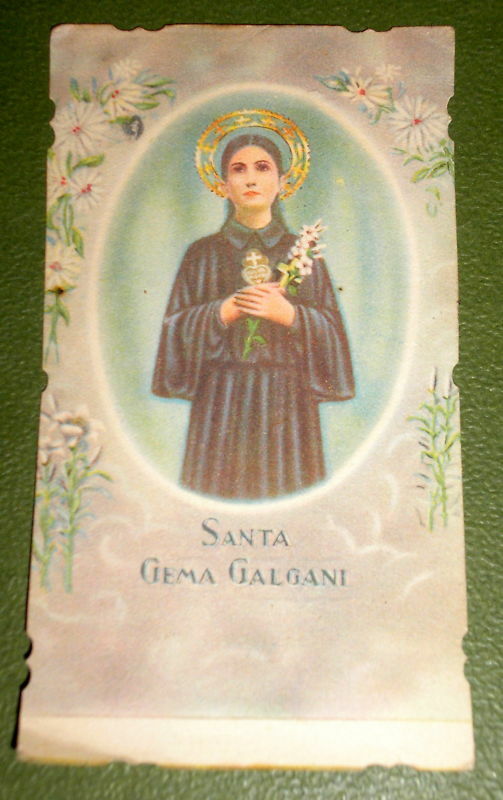 Thank You Saint Gemma for inspiring us and caring so much for us sinners. And thank you Mr Dallaire for this wondeful site! I have just recently started learning about St. Gemma. What a beautiful soul she is. I just purchased the book "The Life Of St.Gemma" and have started praying to her. Lovely St. Gemma just healed our dog! Our dog Alexa is a poor old lady, 10 years old, which is quite old for a Newfoundland dog. Alexa slipped a disc just a few days ago, followed by a paralysis from the shoulders down, she couldn't move her legs at all! My mother was advised to take her to the closest animal hospital. I began praying a triduum for the sick and infirm to St. Gemma. The next day, my mother brought Alexa to the hospital, where they said the prognosis was quite sorry, but they would keep her under supervision for a day or two. I kept praying the triduum. The next day, just as I finished the triduum, the doctors called and said it looked much better and they could do surgery now! The surgery went well, the surgeon was very pleased. He said Alexa would be able to get up after at least ten days, and it would take up to four weeks until she could walk small distances again. But Alexa got up the very next day, and today (a day after that), she walked for ten minutes! She regained full control of her limbs and bowels, in spite of her advanced age! What's more, my mother, who isn't a Christian at all, told me that she, too, said a prayer, promising that if Alexa should be healed, she would accompany me to mass. It is all our dear, dear St. Gemma's doing. God bless you, St. Gemma! We love you! Thank you for sharing this wonderful story of St Gemma's intercession on behalf of your family. -St Gemma, pray for us! 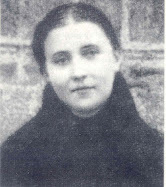 I employed the intercession of St Gemma Galgani when my brother has spinal tuberculosis and he was healed on the ninth day of St Gemma novena. She is the patron St of my family. Yes, you can definitely pray them both together if you so choose. Prayers are never wasted! Hi, Glenn thank you for your reply. I am greatly impressed by this humble saint. Recently I was operated of hiatus hernia, but still I m having problems of acid reflux and pain. When I read about st Gemma, I felt to prayer the novena for my full recovery. I m on the 7 th day, and desperate. Can I get a relic card or any picture. I am from India. Hi it's very inspiring, can you tell me how it all happened.